2014 was the biggest year in FinTech by far with billions being invested globally, which is to be expected in a global growth sector. But how much was invested globally in FinTech this year? It depends on how you classify FinTech. StrategyEye estimated that there was $2.8Bn raised in 2014 via venture capital investments in FinTech. However, this doesn’t gel with the fact that Crunchbase and MarketsMedia calculated that in the first quarter of 2014 alone $1.7Bn was invested in 167 deals. These metrics also don’t include the IPO of LendingClub, which raised over $800m alone, or the plethora of $100m+ investments that banks like HSBC, Sberbank, BBVA, Santander and others have committed to FinTech. Just in Bitcoin related startups alone, more than $400m was invested in 2014. At Money2020 this year a venture capital panel predicted that venture capital deployment in FinTech will top $20Bn in 2015, whereas Accenture recently predicted FinTech investments would reach at least $8Bn by 2018 in New York alone. So whether you believe the FinTech investments this year were $6Bn or whether you believe the bigger estimates of upwards of $18Bn, one thing is clear – FinTech is really hot right now. But it’s only going to get hotter. Did Will Ferrel really say this? Silicon Valley leaders like Marc Andreesen and others have put out the challenge for start-ups to change the world of banking, and in this respect Bitcoin has received more than its fair share of attention, despite being considered one of the worst investment or asset classes in 2014. Perhaps with the speculation dying down on Bitcoin, we can finally see investments in the Blockchain unencumbered by hype of the crypto-currency potentially hitting USD$1m per BTC that we saw in December of 2013. The reason Andreesen and others have been looking to Bitcoin as the platform for disruption is that when it comes to pure play digital banks, it is pretty clear that the so-called “Facebook of Banking” won’t have a banking charter. Why not? Scale and high-growth potential is always going to be the metric of a true bank-killer start-up, but when you look at what is required to build a start-up bank with more than 100 million customers globally, you run into unique problems in banking that you would never have with say a social media or consumer tech startup. One of the key issues in funding a banking start-up is capital adequacy requirements. To understand the scale of this funding requirement let’s look at JP Morgan Chase who has approximately 80-85 million customers in the United States, with a deposit base of $1.2 Trillion. Current FDIC capital asset ratio requirements requires JP Morgan Chase to maintain capital adequacy of a minimum of $50 Billion in capital just to support this deposit base. Even with the explosion of investment in FinTech, we’re not going to see VC’s participate in funding capital adequacy – ain’t going to happen. VC’s want growth and want to fuel growth, but if you’ve got a $50Bn capital adequacy baseline, you simply aren’t funding growth, you’re funding compliance – and that isn’t going to get investors excited. 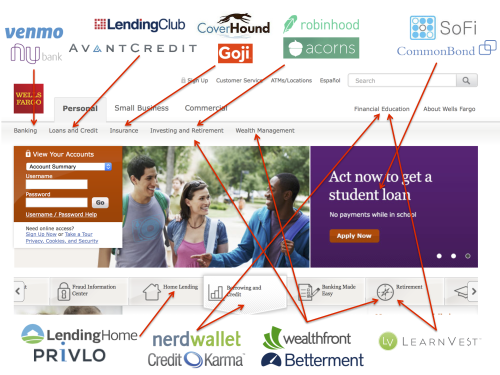 @cdixon @JackGavigan @Kwdmiller @aweissman I am dying to fund a disruptive bank. The long and the short of the debate is this. Can you truly disrupt banking without owning the stack and owning a charter? If you look at the start-up landscape though you’ll see three overarching trends. Firstly, the fintech start-up landscape is dominated by non-banks without charters who continue to get the bulk of VC investment, so purely on a statistical basis, the chances that a chartered start-up will grow to the size required is extremely low. Secondly, most start-ups don’t want the pain of compliance and regulation that comes with owning a charter, for the reasons mentioned above – a charter is not an advantage when it comes to raising money, in fact, it is seen as a deterrent in fund raising. Some start-ups grow to the point, as with Lending Club, where they do own the ‘full’ stack in their space, and have grown to a scale where they can cope with the compliance workload, but even so they aren’t a bank with a charter. Simply put, the upsides of owning the full stack just aren’t there for start-ups or investors, and the likelihood that a traditional play with a charter will emerge as a mega digital bank with 100 million customers is basically zero at this point because that’s not how Fintech is panning out, and it’s not how investors invest. What the $100 Million club worked out, and what VC’s have mostly worked out, is that the threat to traditional banks is not a pure-play digital bank that attacks banking across the board. If you look globally for evidence of that sort of a bank you can really only find two examples – mBank in Poland and Fidor in Germany. While mBank has been phenomenally successful at redefining themselves as a digital bank, they’re just not looking to launch outside of Poland, and certainly not in the defining FinTech markets like New York or London. Fidor is working hard to launch outside of Germany, not just a core banking system, but increasingly as a ‘bank as a platform’ or bank as a service. Fidor is largely agnostic to who owns the customer or distribution capability – they don’t require it. On the other hand, AngelList lists 3,800 FinTech start-ups alone attacking the banking or financial services space. That’s a ratio of 1:2000 start-ups that believe investing in the experience is much more important that investing in the stack or the charter. When you look at the last 250 years of technology disruption, the biggest players that have disrupted industries were never players who iterated on the existing industry model, and they weren’t incumbents. They were players who thought fundamentally differently about the business model, distribution model or the underlying technology. It’s why Amazon dominates book sales today and traditional book distributors are falling by the wayside, and it’s why Apple and Spotify dominate music, while Virgin, Tower Records and HMV stores are all gone. The trick to FinTech innovation is not growing a new, better stack. It’s building better experiences. At the end of the day 100 million customers are going to drive the creation of a global downloadable bank account, a global P2P lending service, or a new payments ecosystem – not the FED, FDIC, FSA, SEC, ECB, etc. Owning a charter isn’t going to be a differentiator to investors or customers. On the other hand, as FinTech players mature into 100 million customer businesses, scale will demand a stack that provides real-time, secure utility and mostly flawless experience. Many of these players will find that their bank partners, processors, lending partners and others can’t grow quick enough and aren’t flexible enough to reach that sort of escape velocity, which will require them to mature their stack, and maybe even invest in or acquire some businesses that have relationships with regulators that smooth that growth curve. In fact, it is increasingly unlikely that west coast FinTech start-ups like Clinkle, Plastc and Coin will get off the ground as Silicon Valley realizes that you just can’t start a Facebook of Banking in a garage – at some point you need to interface with the banking/payment ecosystem and the learning curve is too steep for Stamford graduates with a tech competency. This is why we’ll continue to see a separation of the distribution business and the charter/stack/manufacturing elements of the banking business. It’s why Antony Jenkins from Barclays said the Universal Model of Banking is over last week. It’s also why some of the biggest banks in the world are investing in start-ups, incubators and innovation labs – because they know they can’t produce the experiences required for the customer of tomorrow. To be the Facebook of Banking you need 100 million customers who love your experience and you need funding, neither of which (it turns out) require you to own a charter or the full stack. But you definitely won’t get there without a differentiated experience.